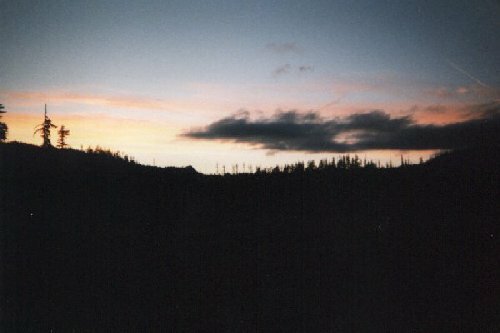 Sunset looking to Granite Peaks from high rock quarry. A friend of mine in Bigfooting posted me stating that both of the I-R cameras were lost - stolen. He had put them up near Bull Run, the possible Mecca of Bigfooting. He noted he had put them up on an overgrown road. 1. Don't put sets up together. Separate them. 2. Do not put them on any road or human pathway. Period. Not even old. 3. Do not put them up in areas heavily used by humans during some seasons. The reader can make up some more or explain the above in more detail, but those are our preventative measures. Of course, we were more interested in positive results set-ups. 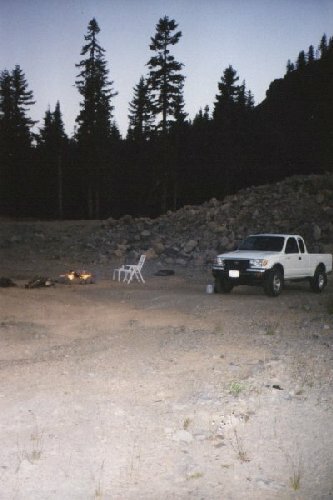 I had wanted to retrieve the units so that I could take them up near the rock quarry and set-up. Tonight was the Perseid meteor shower peak and I was going up to the mountains. I got to the quarry and with my luck running consistent, it was clear until just after dark and then the clouds started coming in. Saw a few good shooters through breaks, but then they boiled over the sky solid. In total, I only saw four meteors. Disappointing. For at least the last five years, I have been going to the east side of Mount Hood to watch them and have had good luck, except for one moon lit night. They are quite the show on a warm and dark summer night. Earlier in the year, a noted Bigfooter, now out of the field, had sent me an e-mail. To the best of my knowledge, he is part Native American and he works with various Tribes. He mentioned to me that I should spend a night on high mountain saddle during the second week of August. Maybe then, I could have contact with the Bigfoot - Sasquatch creature. While his message was brief, I had often wondered if there was much more to it. The Perseids are one of the major meteor showers of the year and it always occurs in the second week of August. It was misty and there was a heavy dew up at 5,000' just after dark. Partly it was the altitude and dew point change and partly it was the moisture in the air from the coming storm. I kept the fire going. On the way up, I had stopped at a fallen log that had slid down quite a slope when the overhang gave way. The branches alone were plenty big for fire wood, so I had cut some with the pruning saw. It was probably silver fir and it burned beautifully - like but without the sparking of cedar. As I had driven along, I was stopping at the fallen trees and taking some of the good parts to make fire. By the time I got to the quarry, I had a nice load of various woods. My last stop was at a moss covered fir that had slid off the overhang. I took a lot of the mossy limbs to make and start fire. The back of the truck was quite a sight when I pulled into the quarry. Then I started hearing cat-like calls close in to the quarry on the SE side, the tree slope side. They got louder. They were intermittent. They moved toward the SW side of the quarry wall, up by the road entrance. I tried the little recorder. Too much wind noise in the background. 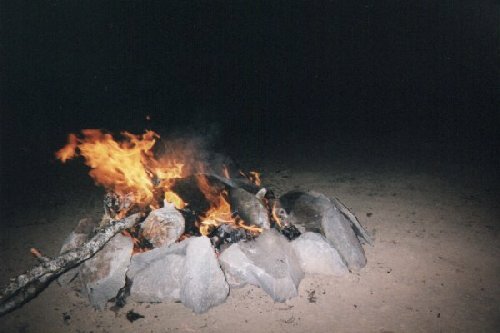 When I would throw more wood on the fire and got a light jump to the edge of the quarry, it seemed to irritate the critter and it would cry out. Since it was going to rain anyway, I didn't even set up the cot. I tried to stay awake and the creature kept at it. At about 1 AM, I finally got into the truck, leaned the seat back, got out my pillow, spread the bag over me, left the window down so I could hear and went to sleep. Occasionally during the night, something would wake me and then I would go and drop some more wood on the fire. It kept going all night. I had some excellent shield wood I had found and had put it on the last time I was up. It kept the fire going until morning. In the morning, I took some mossy twigs and crushed them up real good and stirred the coals. There was a bunch of smoking and then the flame burst and I had a good fire again in the light rain. It was about 7:30 when the mist turned to rain and the drops coming through the open window woke me up. I still wanted to sleep. It was sort of comfy in there. I got up and hustled out the little stove and started water boiling to make coffee and got back into the truck and watched the rain and the clouds up in the mountain tops. It was peaceful and beautiful. I drank a bottle of juice waiting for the water to boil. The rain was enough to settle the grounds in the coffee. It tasted good and I had a couple of cups. There was no hurry. There wasn't going to be any hiking today, too wet. When I drove down hill to the Big Bottom area, the rain stopped. Down by the Clackamas River, it was just overcast. The rain was up at the mountain crests. On the way back, I stopped at the Carver Café. It's a little place, like a converted house, that serves very good food. I had hash browns, gravy and well-done patty sausage with coffee and water. No eggs or toast this morning. They give a genuine pile of hash browns. As I finished the drive home, I thought I should have kept going to Central Oregon to watch the meteors. The rain had been predicted; but, the view from the rock quarry is so good.